Truth be told, I’ve been going to Virtuoso events off and on for more than 20 years now. I’ve attended the luxury travel network’s annual Travel Mart and its Symposia many times over the last two decades, but three years ago Virtuoso renamed its annual conference as Virtuoso Travel Week (or Virtuoso Week) in a move to become the “fashion week” of the travel industry. 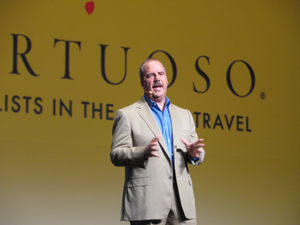 Having just returned from Virtuoso Week at the Bellagio in Las Vegas, I can tell you that Virtuoso has already achieved its goal and then some. Sure, some things can be improved, including the number and level of media that attend the event—which drew a record 40 journalists this time around. I mean wouldn’t it be great to have cameras from VH1, Entertainment Tonight or some of the other big “style” outlets in attendance, as well as even more mainstream consumer media? But with roughly 4,420 attendees from 92 countries, including 2,124 Virtuoso travel advisors and 1,836 preferred supplier partners, Virtuoso Week lived up to its theme, “enriching lives through human connection,” by bringing together the travel industry’s top players in the luxury travel space. Regardless a total of 4,420 makes Virtuoso the largest travel agency show in the business today, even though that number is roughly half of what one of the old American Society of Travel Agents World Travel Congresses used to get. Nevertheless, Virtuoso Week truly is a phenomenon that most first-time attendees just can’t seem to believe. While other consortia and travel marketing networks have some wonderful events where they do great business, Virtuoso has turned its event into a “happening” complete with lots of lavish awards dinners (three Academy Award-style events were staged during the event) and numerous other parties and receptions hosted by preferred suppliers and travel agencies. Once again what truly impressed me about Virtuoso Week was the vibrancy and youth of the Virtuoso travel advisors themselves. On the Saturday before the conference officially began I attended a Virtuoso reception for millennial travel advisors and suppliers. There were nearly 300 people in the room, and Virtuoso CEO Matthew Upchurch and I were probably the oldest at the reception (I asked him for his ID card). If ever I again hear travel agents being described as a “dying” profession, I would simply point to Virtuoso Week as evidence that so many younger people are now entering the market. Other travel agency groups have also set up their own young professionals organizations, and there are now roughly four independent “young” professionals associations vying for members today. Between Virtuoso’s millennials reception and its famous Club V—where Virtuoso takes over the Bank dance club at Bellagio—it’s clear that the travel industry and the travel agency business in particular is set for a new renaissance, as more young people recognize what a truly great profession this is. I mean, where else can you travel far above your means and sell a product that everyone wants? PHOTO: Virtuoso CEO Matthew Upchurch spoke to a well-attended opening general session. Of course, there are some questions about the future of Virtuoso Week that Upchurch and his team will need to answer. Right now the Bellagio is straining to accommodate everyone (meetings were held in hallways and on ballroom stages). A number of people are already staying at nearby MGM resorts Vdara and Aria and we had several functions at Vdara this time around. But Upchurch tells me that he envisions a campus-like conference that will move among a number of different resorts in Vegas, which would provide more space for growth beyond the current attendance. Virtuoso also continues to focus on its famous (or perhaps infamous) four-minute, one-on-one meetings between travel advisors and suppliers, with nearly 354,000 meetings taking between Aug. 11 and Aug. 15. Every Virtuoso-affiliated advisor has an opportunity to meet nearly every Virtuoso travel partner. Now I question whether that will be the most effective organization of everyone’s time in the future as the conference gets even bigger. On the other hand, Virtuoso executives seem to regard the one-on-one meetings as almost a rite of passage, so I’m not sure much will change on that front anytime soon. Virtuoso also uses its annual event to introduce new or updated programs, which this year included its revamped Virtuoso.com website, a new co-branded website program for travel agency members and individual advisors, a new lead generation program supported by several supplier and destination partners, and a more formalized program around Virtuoso’s Return on Life concept that seeks to provide travel advisors with a structured process and tool set to help meet their clients' travel needs for a lifetime. RELATED: Who Were The Top Luxury Travel Suppliers at Virtuoso Week? What Virtuoso Week also needs is more suppliers announcing the latest “lines” if you will—the new products and itineraries for cruise lines, hotels and tour operators, as well as other suppliers. Virtuoso is been building on this over the past three years, and keeps changing the events where suppliers interact with the press. But a series of simple quick press conferences might be the solution, depending, of course, on whether what is announced is new and relevant to the luxury travel business. All in all, however, this was the best Virtuoso Travel Week yet! I go to nearly every travel industry conference in the business, and all of them fill a tremendous need in terms of training, networking and real business generated. For me, however, there’s no question that Virtuoso Travel Week is the largest, most unique travel agency forum in luxury travel here in the U.S. and maybe the world. It may not be for everyone, but it’s now established itself as one of essential events in the travel business today.